posted by Billie Owens in batavia, news, Announcements, 2018 recognition awards. An outstanding individual in the community that demonstrates excellence in volunteerism. This individual goes above and beyond normal responsibilities creating a lasting and beneficial impact. An engaged resident who has given extra effort to go above and beyond in maintaining their home and enhance their neighborhood. A business that has demonstrated community involvement and represents entrepreneurial spirit while providing exceptional customer service, professionalism and integrity. Providing service to the people of the City by demonstrating commitment in improving quality of life throughout the community. If you know of someone that you would like to nominate please complete the nomination form and submit to Lisa Casey by Friday, March 8. The awards will be presented by City Council at a future City Council Meeting. Mail nominations to: Lisa Casey, City of Batavia, One Batavia City Centre, Batavia, NY 14020. Fax nominations to (585) 343-8182.
posted by Billie Owens in GO ART!, Creative Arts Camp, news, Announcements. The GO ART! Creative Arts Camp is an amazing opportunity for students in grade 1-6 to explore all things artistic. From fine art to performing arts, we will discover our inner artists together in a safe and welcoming atmosphere. Students will have the opportunity to draw, paint, dance, sing, play, build and so much more. Fine arts, performing arts, literary arts, culinary arts, design arts, tech arts -- experience it all! Camp will be held at GO ART! in Downtown Batavia from 9 a.m. to 3 p.m., Monday through Friday, Feb. 18-22. Drop off for participants begins at 8:30 a.m.
Fee is $135 for GO ART! members (or $125 each child for multiple family members). Fee is $150 for nonmembers (or $140 each child for multiple family members). All materials included; deadline to register is Feb. 14. First come, first serve. GO ART! is located in the historic Seymour Place building at 201 E. Main St.
For further information please contact GO ART! at 585-343-9313 or register online here. posted by Billie Owens in news, Announcements, east bethany, mary immaculate parish, winter escape. "Winter Escape" tickets are on sale now! Escape the winter blues with family, friends, delicious food and live music on Feb. 2 at Mary Immaculate Parish in East Bethany. The third annual fundraiser will start at 5:30 p.m. at the Immaculate Conception Hall with a delicious Farmer's Wife Turkey Dinner. From 6:30-10 p.m. there will be live music from Red Creek Band. There will be a Gift Basket Raffle. This fun-filled family event is not to be missed! Tickets are $20 for adult tickets; $10 for children 12 and under. Remember, tickets are pre-sale only so get yours now so you don’t miss out! For tickets please contact Jill Gould at (716)-474-0850.
posted by Billie Owens in byron, bergen, Byron-Bergen Central Schools, kindergarten, UPK, Announcements. Registration is now underway for the 2019-2020 school year for prekindergarten and kindergarten students in Byron-Bergen Central Schools. The Byron-Bergen School District hopes to once again offer a half day Universal Prekindergarten (UPK) program for the 2019-2020 school year. The class will be held at the Byron-Bergen Elementary School, located at 6971 W. Bergen Road, Bergen. Brian Meister, Elementary School Principal, 6971 W. Bergen Road, Bergen, NY 14416. Parents who have already contacted the Elementary School by phone will still need to send in a letter to be eligible for UPK. Please note that if we receive more than our allowed capacity, we will select students using a lottery system. What are the Program Goals of the UPK at Byron-Bergen? To create an inclusive community that builds upon the student’s strengths and accommodates their needs. The UPK program at Byron-Bergen is focused on socialization, learning through play, and self-exploration. Children learn through a hands-on learning environment that includes activities, learning centers, concrete materials, and manipulatives. Students learn through a nurturing environment that is enriching, challenging, and developmentally appropriate. Children who will be five years of age, on or before Dec. 1, 2019, are eligible for entrance to kindergarten in September of 2019. New families in the school district should notify the school if they have a child that will enter kindergarten in September of 2019. Byron-Bergen Elementary School, 6971 W. Bergen Road, Bergen, NY 14416. All children registering for kindergarten will be scheduled for a screening appointment this summer. The results of this screening will be used to plan for the 2019-2020 Kindergarten Program. Certificate of Immunization – New York State law requires that every child entering school must have received a minimum of 5 doses of diphtheria-pertussis-tetanus vaccine (DPT) and 4 doses of polio (IPV) vaccine, 2 doses of MMR (measles, mumps, rubella), 3 doses of Hepatitis B, and 2 doses of varicella (chickenpox). Those children born on or after 1/1/2008 must have 4 doses of Pneumococcal Conjugate Vaccine (PCV). Their immunizations must be completed prior to entering school. Proof of Residency– If this is the first time you have a child entering Byron-Bergen Central School District, please bring proof of residency to your screening appointment. This can be a copy of your mortgage statement, rental/lease agreement or a copy of your tax bill. posted by Billie Owens in Oakfield, news, Announcements, Oakfield Republican Committee. posted by Billie Owens in elba, news, Announcements. NOTICE IS HEREBY GIVEN that at a Republican Caucus is to be held at the Village of Elba, on Monday, Jan. 28, for the following offices that are up for reelection on March 19. Notice of the scheduled date of the caucus is being given at least 10 days before the caucus as required. Please contact Laurie Itjen Republican Chairperson at (585) 757-2257 with any questions. posted by Billie Owens in Town of Alexander Republican Committee, news, Announcements. Also seeking registered party members for Town Republican Committee Member District #2 (east of Route 98). Those interested please send letter of intent and resume by Jan. 31st to: Barbara Eddy, 11054 Alexander Road, Attica, NY 14011, or contact at 585-507-9930.
posted by Billie Owens in city of batavia republican committee, news, Announcements. The City of Batavia Republican Committee is seeking City Republicans interested in running for the positions of City Court Judge, City Council in wards 1-6 and County Legislators in districts 7-9.
Letters of interest can be mailed to City Republican Chairman David Saleh at 116 Naramore Drive, Batavia, NY 14020. Chairman Saleh can also be reached at 585-599-3540. If you are interested in getting involved in making Batavia a better place to live and work then we want to hear from you! posted by Billie Owens in GO ART!, news, Announcements, juried art show. GO ART! announces its third annual juried art show entitled "Art of the Rural." Entries will be accepted March 7 – 9. No entries will be accepted after March 9. Exhibit dates are March 14 -- May 4. There will be an opening reception from 6 to 8 p.m. Thursday, March 21, at GO ART!, located in the historic Seymour Place building at 201 E. Main St. in Downtown Batavia. This juried show is open to all artists. All works must be ORIGINAL and created by the submitting artist. Previous entries are not permitted. Any media is acceptable, no larger than 3' X 4'. All entries must be accompanied by an entry form, and dropped off to GO ART! at Seymour Place. Fees are due at drop off. GO ART! members may submit up to five works for $30; $5 for each additional work. Non-members may submit up three works for $30; $5 for each additional work. A jury of selection will review all entries and will choose artwork to be displayed in the exhibit. Notification of the jury's decisions will be made March 12. All results will be sent via email unless otherwise requested. Please make sure to provide a valid email address to receive your jury results. Cash prizes will be awarded and announced at the opening reception. posted by Billie Owens in GCC, financial aid, education, news, Announcements, FAFSA, AEOC, TAP. The Adult Educational Opportunity Center (AEOC) is visiting every Genesee Community College campus center in January to help any current or potential student through College Entry Point and FAFSA (Free Application for Federal Student Aid) Workshops. Wednesday, Jan. 30, from 9 a.m. 'til 5 p.m.
Tuesday, Jan. 15, from 9 a.m. 'til 12 p.m.
Tuesday, Jan. 22, from 9 a.m. 'til 12 p.m.
Tuesday, Jan. 29, from 9 a.m. 'til 12 p.m.
Thursday, Jan. 17, from 9 a.m. 'til 3 p.m.
Thursday, Jan. 31, from 11 a.m. 'til 7 p.m.
Tuesday, Jan. 15, from 11 a.m. 'til 4 p.m.
Thursday, Jan. 17, from 11 a.m. 'til 4 p.m.
Tuesday, Jan. 22, from 9 a.m. 'til 2 p.m.
Thursday, Jan. 17, from 9 a.m. 'til 12 p.m.
Thursday, Jan. 24, from 9 a.m. 'til 12 p.m. The complete calendar of AEOC support workshops, financial aid sessions, College Entry Point events and more is available at www.genesee.edu/aeoc/. One of the most popular workshops the AEOC offers are the "FAFSA Fests" (Free Application for Federal Student Aid). During these sessions, anyone can receive help in completing the FAFSA and TAP (Tuition Assistance Program) forms. Interested individuals are encouraged to contact the AEOC office at 1-888-394-2362 or via email at [email protected] to reserve a seat in any session and to learn about what information and materials are required for participation. All of the AEOC services are free and available to anyone, not just students of Genesee Community College. With dozens of events taking place throughout the Genesee, Livingston, Orleans and Wyoming counties, the AEOC is readily available. For a complete list of AEOC workshop and other events, visit the new calendar of events online here. To learn more about any of these AEOC services, please visit here or contact the AEOC office at 1-888-394-2362 or via email at [email protected]. posted by Billie Owens in news, Genesee Justice, northgate free methodist church, charity, Announcements. 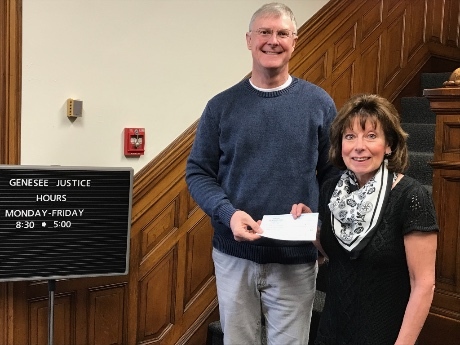 The Genesee Justice office, part of the Genesee County Sheriff’s Office, received a nice donation Wednesday from Pastor Vern Saile at the Northgate Free Methodist Church in the amount of $2,732.11 from a day of giving they did through the church. The money will be used partly for staff trainings and also for program expenses not covered by any other funding received by the office. "We are very appreciative to be chosen as the recipient of this check to fill existing gaps in our programs," said Tammy Schmidt, financial management assistant, Genesee Justice / Child Advocacy Center. Top photo: Pastor Vern Saile, of Northgate Free Methodist Church, and Cathy Uhly, program coordinator for Genesee Justice. posted by Billie Owens in batavia, news, teen city, city youth bureau, Announcements. The City of Batavia Youth Bureau and the Genesee County YMCA invites all 6th through 12thgrade students in the City of Batavia to submit a logo design that will be used with the opening of Teen City. Contestants must be enrolled as a 6th– 12thgrader who resides within the City of Batavia or attends Batavia City School District, St. Joseph Catholic School, Notre Dame High School or GVEP. Poster should be no larger than 9”x12” and must leave the bottom 2 inches blank. Artists should include Teen City in the logo design. Artwork should be submitted in portrait (vertical) orientation. Each submission should be the original student’s work. Each entry must include the artist’s full name, address, phone number, grade, age and school on the back of the poster. Designs can be in any medium, including computer-generated. They should be clear and concise, easy to read. Entries must be received in person or by mail by 4 p.m. on Monday, Jan. 28. Submissions can be sent to the Batavia Youth Bureau, Attn: Teen City Logo Contest, 12 MacArthur Drive, Batavia, NY 14020. The winning logo will be used for all signage of Teen City and on staff shirts. The winner will be recognized at the Teen City Kick-off Event in 2019. For more information contact the Batavia Youth Bureau at 345-6420.
posted by Billie Owens in news, Announcements, Richmond Memorial Library, Richmond Reads. Richmond Memorial Library is thrilled to announce a new initiative entitled “Richmond Reads -- A Community One Book Program”! Since the end of "A Tale for Three Counties," the community has frequently asked if there will be a replacement program. We are happy to share that a committee has been hard at work to make this a reality, which will begin with an inaugural program this fall. Richmond Reads is a community reads project created especially for the Richmond Memorial Library community. Much like the Tale program, we will invite our community to read a book and join in discussions about it -- culminating in a visit from the author! We will host a reveal event to announce the chosen title and author for Richmond Reads on Monday, Feb. 25 at 7 p.m. in the Reading Room at the library. More information about the program will be shared at this event. The event will include light refreshments and a chance to win a copy of the chosen title. Richmond Memorial Library is located at 19 Ross St. in the City of Batavia. posted by Billie Owens in Genesee Chorale, news, Announcements. A new season for Genesee Chorale is about to start. It is a nonprofit choral group drawing singers from Genesee, Wyoming, Orleans, Livingston, Erie and Monroe counties. Genesee Chorale invites area singers to join in the new season, with Monday night rehearsals from 7 to 9 o'clock beginning Jan. 14 at St. James Episcopal Church in Batavia. “Voices of the Earth” is the theme for April 5 and 7 concerts, and a May 19 concert will celebrate the music of Andrew Lloyd Webber. Ric Jones is director, and all skills and voices are welcome. For further information contact Heather Lovelace at (716) 531-8986, e-mail [email protected], or visit the chorale's website, geneseechorale.com. posted by Billie Owens in GC health department, radon, public health column, news, Announcements. January is Radon Action Month! Did you know that radon is a naturally occurring, radioactive gas? It has no smell, taste, or color. Radon forms from the breakdown of uranium in soil, rock, and water and circulates into the air you breathe. When radon is formed under homes and buildings, it can penetrate through cracks in the foundation, leading to high levels of radon, especially in enclosed areas. Sarah Balduf, Environmental Health director of Genesee and Orleans counties, explains how easily radon can seep into your home. It is understandable how this colorless, odorless gas can go unnoticed. If high levels of radon in your home are undetected for an extended period of time, the risk for developing lung cancer can occur. According to the Environmental Protection Agency (EPA) radon is the second leading cause of lung cancer. If you smoke and live in a home with high radon levels, your risk for developing lung cancer significantly increases. Testing your home with a short term radon test kit is the quickest way to determine if there are high levels of radon present in your home. The Genesee County Health Department has an allotment of short-term test kits that are free of charge for Genesee County residents. These test kits are easy to use and contain basic instructions on how to receive the most accurate results when testing your home for radon. “Testing your home for radon and taking action sooner rather than later could save the health of your family,” Balduf said. "Testing your home for radon is a simple process that is free of charge to Genesee County residents when you request a kit from the Genesee County Health Department." If you do live outside of the county, inexpensive radon test kits can be purchased at hardware stores. If test results come back and the radon levels in your home are greater than 4 picocuries per liter of air [pCi/L], which is the “take action” level determined by the EPA, a certified radon mitigator can install a radon reduction system in your home. Take action against radon this January! For more details about the program or to receive any of these services call the department at 585-344-2580. New photography exhibit called 'Beauty of Western New York' on display at GO ART! posted by Billie Owens in GO ART!, photography, Western New York, news, Announcements. A new photography exhibit entitled the "Beauty of Western New York" by Don Fryling is now showing at GO ART!, located in the historic Seymour Building at 201 E. Main St. in Downtown Batavia. The exhibit runs through Jan. 20. There will be an artist reception for Fryling from 6 to 8 p.m. on Thursday, Jan. 17. Tavern 2.o.1 will be open. posted by Billie Owens in news, Announcements, east pembroke, East Pembroke Fire District, public notice. posted by Billie Owens in st. joseph school, batavia, education, National Catholic Schools Week, Announcements. St. Joseph School in Batavia announces its upcoming Open House and plans for National Catholic Schools Week 2019. The theme this year is “Catholic Schools: Learn. Serve. Lead. Succeed.” The theme encompasses several concepts that are at the heart of a Catholic education. There is no better way to invest in a child’s future — or the future of our world. St. Joe's is located at 2 Summit St. in the City of Batavia. An Open House for prospective families will be held from 10 a.m. - 12 p.m. We will be kicking off the week with “The Great St. Joe’s Slime Off!” from 11 a.m. to 12 p.m. in the school cafeteria. Parents are invited to join their children for lunch and to play bingo afterward. Grades K-4 will enjoy lunch and play bingo from 11 a.m. - 12 p.m. and grades 5- 8 will follow from 12:15-1:15 p.m. We will be kicking off a kindness challenge with an assembly for all students at 8:30 a.m. in the cafeteria. The 8th grade will have a robotics competition at 1:30 p.m. in the gym. This will be a “theme dress-down day.” Each class will decide on a different theme. We will be walking to Batavia Showtime to see a movie (TBD) at 9 a.m.
Students in grades K-2 will be walking to Mancuso Bowling Center to bowl from 9 -11 a.m. Students in grades 3-5 will be walking to Mancuso Bowling Center to bowl from 11:30 a.m. - 1:30 p.m.
Students in grades 6-8 will walk to Falleti Ice Arena to skate from 11:30 a.m. - 1:30 p.m. A pizza lunch will be provided for all students before they leave. Students will participate in a number of activities in their “houses” including Zumba, Minute to Win It games, technology challenges, team building activities, engineering projects, a scavenger hunt, and a kindness challenge. This is a non-uniform day and students may come to school dressed in their pajamas. All grades will attend mass at 8:30 a.m. At 1 p.m. we will have our annual 7th and 8th grade exhibition basketball game in the gym. Students in grade 6 will be in attendance to cheer these students on. Grades 3-5 will have the choice to participate in a Just Dance Craze or attend the 7/8 grade basketball game. Grades Pre-K-2 will participate in Jump Rope for Heart (sponsored by the American Heart Association) activities in the cafeteria. Please note: Grades 3-8 will participate in Jump Rope for Heart activities throughout the week. Donations are being collected in the cafeteria and the class with the most money raised will receive a prize. posted by Billie Owens in northgate church, batavia, news, Announcements. Grief Share, a 13-week group designed to help and encourage those grieving the loss of a loved one due to death. The format is a weekly video presentation and discussion time that offers hope and comfort. Find more information at http://www.griefshare.org/about. Meetings will take place on Tuesdays from 6 to 7:30 p.m., starting Jan. 22nd, at Northgate’s North Campus, 8160 Bank Street Road, Batavia. There is a $15 cost for workbooks, scholarships available. Divorce Care, a friendly, caring group of people who will walk alongside you through one of life’s most difficult experiences. Don’t go through separation or divorce alone. Divorce Care seminars and support groups are led by people who understand what you are going through and want to help. You will learn how to heal from the deep hurt of divorce and discover hope for your future. A new 13-week session begins on Saturday, Jan. 19th, from 6 to 7:30 p.m. at Northgate’s North Campus. There is a $15 cost for workbooks, scholarships available. Mothers of Preschoolers or “MOPS” are women who gather together twice a month to share and support each other in the remarkable journey that is motherhood. Meetings consist of relevant speakers, fun crafts, supportive conversations and fellowship. There is always hot coffee and childcare provided at MOPS meetings. Moms can choose a 9 a.m. group or a 6:30 p.m. group. MOPS is open to all moms with children from birth to their youngest child finishes kindergarten. MOMSNext is also available for moms of school-aged children, they meet every second and fourth Wednesday from 6 to 8 p.m. Visit Northgatefmc.com/mops for more information. Each group has a separate membership fee, scholarships are available. Financial Peace University will be held on Wednesday nights, starting on Feb. 13th, from 7-8:30 at the North Campus (8160 Bank Street Road, Batavia). For more than 25 years, Financial Peace University, created by Dave Ramsey, has helped thousands of people take control of their money. Through this nine-week course, Ramsey’s proven money class will show you step-by-step how to create a budget, pay off your debt, make wise spending decisions, and save for the future. Preregistration is required, so please visit https://fpu.com/1079986 to sign up. The cost for the class is $129, scholarships are available. If you have questions please email [email protected]. posted by Billie Owens in Announcements, batavia, Genesee Valley Plein Air Painters Inc., art, painting. The Genesee Valley Plein Air Painters will open its 14th Annual Art Show beginning Jan. 1st at Pittsford Barnes & Noble’ Community Room. This competitive, judged and juried show will display about 90 original paintings recently created throughout the Northeast. The plein air show runs through Feb. 1s. "Plein air painting," meaning on-site painting in open air (natural light), is popular with artists and their patrons alike. Boats, rural barns, landscape vistas, gardens, cityscapes and waterscapes are all staple subjects in the plein air painter's repertoire. More than 85 percent of each painting in this show is produced on-site, "in the open air.” Painting mediums include oil, water color, soft pastel, acrylic and gouache. The Genesee Valley Plein Air Painters Inc. is an association of outdoor artists that promotes and inspires quality plein air painting. It was established in September 2005. Genesee Valley Plein Air Painters Inc. (GVPAP) currently boasts 64 artist members who live in the surrounding counties of Greater Rochester, the Finger Lakes, Western and Central New York. Participating artists in the show in Pittsford Plaza reside in Pittsford, Fairport, Canandaigua, Batavia, Macedon, Sterling, Ontario (Canada), Phelps, Kent, Baldwinsville, Livonia, Rush, Caledonia, Dansville and Rochester. The Pittsford Barnes & Noble Community Room at Pittsford Plaza is located at 3349 Monroe Ave., Pittsford. The Reception and Awards Ceremony will be held from 3 to 5 p.m. on Sunday, Jan. 6. GVPAP’s Annual Art Show is free and open to the public. Gallery hours are also the store's hours.